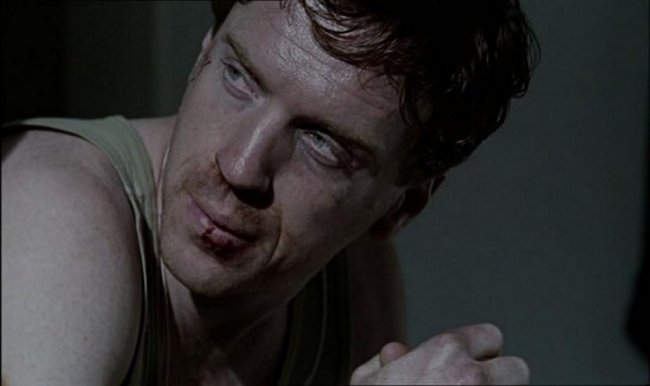 There are spoilers for both Homeland and Colditz in this blog. 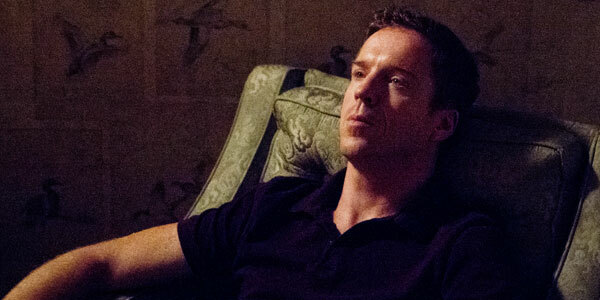 Chatting away about all things Damian as we usually do we discovered that, while Nicholas Brody has my sympathies, Nicholas McGrade does not. Damianista quite likes McGrade (even though it annoys her other half, Lewisto). I’m going to share my thoughts on the two of them and Damianista will respond later. We would also like to hear your thoughts on them so please let us know. It is in the Pilot that Brody took a hold of my heart. It isn’t when the famous “I’m an American” line is delivered. It isn’t as we see him staring in a mirror as he is taken care of in Germany, it isn’t the thousand yard stare as someone asks him if he is ok – how do you answer that after 8 years anyway?- and it isn’t as he is “puking his guts up” on the flight home. No. What really got me is him asking for his mother after being reunited with his wife and kids. It’s the facial expression once he translates Jess’s awkward silence into the reality that his mother did not live to see him come home. Lost little boy doesn’t even begin to adequately cover Nicholas Brody’s plight. If you strip the character down to his core, the Brody we meet came completely into being when that Drone attack killed Issa and the other children. It was the culmination of 8 years of physical, mental and emotional torture, of isolation and separation. A parent would be distraught at what happened to Issa and there is no telling what you might do, but Brody agreed to put himself back in a hole for 9 months so he would look like he needed rescuing when the time came and then agreed to carry out a bombing. He was clearly too dependent on his relationship with Issa which is entirely understandable. Issa is the first human (and an innocent one at that) contact Brody has in years. It is likely that Issa reminded him of the fact that he is a father and of the innocence that a child represents. When Issa was killed the little left of the man with a good heart shattered. Brody’s vulnerabilities and weaknesses, a key part of the character, are fully on display in season one as we see how easily he is manipulated by Nazir (S1, ep9, Crossroads) into going through with what he had decided the episode before (S1, ep8, aptly named Achilles Heel) he could not do. He battled constantly within himself, caught between ensuring that those who killed Issa did not get away with it and trying to re-connect with his own family. Dana is the only one he really manages to re-connect with and it is no surprise it is to her Carrie turns in Marine One. The two people (at that point – Dana would change her mind in S2) willing to try and accept the man that came home rather than wish for the man who left for Iraq. Mostly, Brody found himself unable to re-connect with his old life. The people in it had moved on without him. The man responsible for Issa’s death is Vice President. How sickening that must have been to deal with. In short, his old life likely seemed as far away as it did for those 8 years. He had little left but not to (in his mind) let Issa down. In the end we know he couldn’t do it and it further emphasised how easily Brody could change his mind. From being so sure of himself seconds beforehand and willing to die to someone now sure that he cannot do it because his own children are important. Finally to the crumbling and panicking mess in that car park destroying himself and the one person who could accept him because he can’t stand his daughter knowing his shame. This is a man whose own mind is torturing him now. The episode Grace (S1 ep2) possesses a fantastic piece of acting (one of many) from Damian where Brody is left at home while Jess goes to work and the kids go to school. Unable to deal with the press banging his front door and phoning the house continuously, Brody goes into his bedroom and finds the darkest corner in it, slides down the wall until he is huddled tightly like a ball in that corner. He traces the wall with his fingers and mutters to himself as he has flashbacks about the cell he was held captive in. Damian’s performance in the bunker and the car park respectively in Marine one (S1, ep 12) are absolutely outstanding. From somehow making you feel compassion for him even as though it appears as if he is about to blow that bunker up to making you scream at the TV as Brody rips Carrie’s (his own and everyone else’s) heart out is just superb. 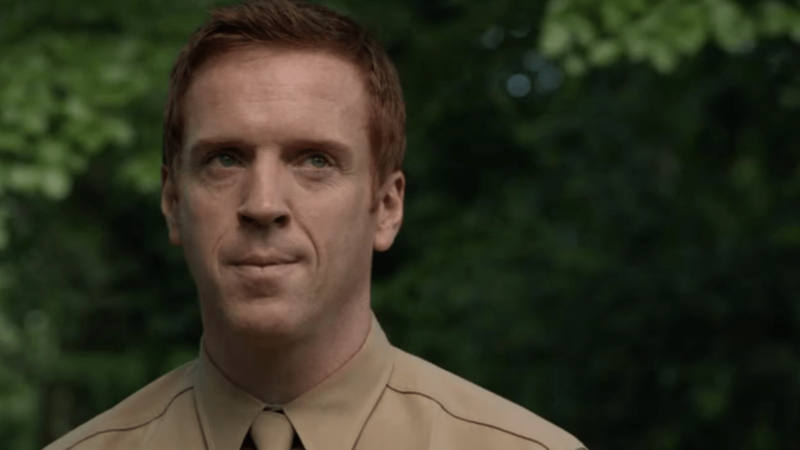 During season 1 of Homeland we questioned every week whether Brody had been turned or not. Damian’s ability to play the ambiguity required to keep us all guessing should not be understated. It is easy to be sympathetic with Brody when you consider his circumstances, but I have no qualms in saying that Damian’s performances make it especially easy to be sympathetic with Brody. McGrade is in your face with his opinions. He doesn’t hesitate to give them and, you might say, that for a soldier who has to make decisions quickly and decisively that is a good thing. However, pay close attention to how Damian holds himself as McGrade. He is always pushing into someone’s space or leaning towards them when making a point to get his way. McGrade likes to be in control and forcing issues to get his way i.e. out of the way of conflict. McGrade does not even attempt to hide his horrendous attitude from his superiors going so far as saying that he isn’t going back to war. Fortunately for him, they have a different role in mind, but this was the first warning sign to his superiors that McGrade is not a man to be trusted or depended upon. He is transferred to MI9, whose job it is to help aid soldiers escaping Prisoner of War camps to get home. McGrade was the first to manage it and so is considered useful. Whilst McGrade is in London, he sets about finding Lizzie Carter (Sophia Myles). Jack (played by Tom Hardy), a fellow soldier and escapee, who is re-captured and put in Colditz had fallen in love with Lizzie. As he is too hurt to accompany McGrade on the last bit of their escape, he asks McGrade to find Lizzie and make sure she is ok and to tell her that he is ok.
McGrade finds Lizzie and does let her know Jack is alive and endeavours to make sure she is ok. He even appears to be genuine initially, but during their first meeting he clearly becomes enamoured with her. The longer he is in London the more selfish he becomes and he looks to take complete advantage of Jack’s absence. McGrade sets about inserting himself into Lizzie’s life, applying pressure to her and backing off when he senses he may be pushing too far too quickly. He can’t help but let his character shine through occasionally though even while trying to be the shoulder for her to lean on. He openly speaks to her about people needing to die as London is being bombed and how he was nothing before the war started and now he means something. He scares her and Lizzie is disgusted with herself and runs away from him after they kiss for the first time. Just after this scene, there is a scene where MI9 are advised that someone has broken out of Colditz and McGrade is clearly concerned it is Jack. There is a clear look of relief when it is confirmed to be Captain Sawyer. Lizzie is thereafter cautious and distant with McGrade who is becoming increasingly agitated by her resolve and loyalty to Jack. McGrade, in his desperation to get what he wants, uses his position to insist that all mail incoming from Jack is forwarded to him and not the intended recipient. He then writes up a false report of Jack’s death on which he falsifies the signature of his commanding officer. This letter is then delivered to Lizzie (via her friend, Jill), who is utterly heartbroken and Jill comforts her. The house in which Lizze and Jill stay in is bombed. They both survive, but Jill’s face is badly scarred and she can’t feel her legs. She is hospitalized while Lizzie is mostly unscathed. McGrade visits the hospital and he and Lizzie talk about Jack and their relationship. He plays it cool at this point agreeing that they should just be friends, being sympathetic and understanding, but his words reveal his motivation to us. He is playing the waiting game. He and Lizzie go to the moves one evening and McGrade can’t help but push the issue of their relationship as he is worried about the fact that he is being sent back out in to the field to aid escapees. Lizzie refuses to be pressurised even after he tells her he is leaving. We see Lizzie visiting her friend Jill in Hospital and Jill laments the fact that a man she had been seeing hasn’t come to see her since the bombing (he is alive) and how no one would love her now. She is scared of dying a virgin and angry at having waited. Lizzie is shocked because Jill had always given the impression that she wasn’t a virgin. Jill replies “it was all I had over you”. Nice! McGrade owes Jill a drink because it is he words that drive Lizzie to him. It is difficult to see McGrade get what he wants, but I can suffer the hardship for how beautiful Damian and Sophia Myles are together in this scene. Lizzie genuinely thinking Jack is dead seeks comfort and love from a man who appears to her to be every bit as good a man as Jack. 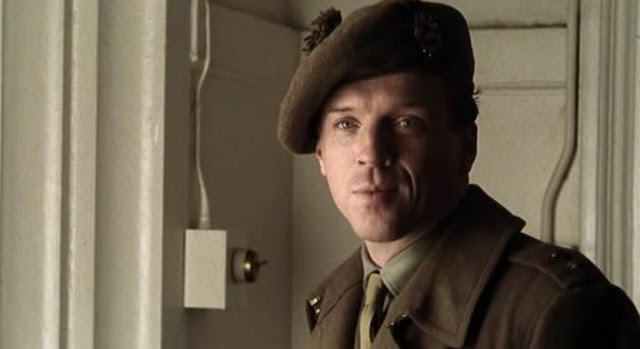 McGrade is then informed that Jack has escaped from Colditz and he is none too happy about it and suggests he should be assigned to assist Jack. He is even less happy when Captain Sawyer is initially assigned the task of aiding Jack back to London. McGrade’s mask of coolness thereafter slips as he becomes increasingly more desperate. It doesn’t help him that Sawyer has clearly worked out what he has done and McGrade attacks him. Knowing Jack is on his way home, McGrade asks Lizzie to marry him and suggests they move to America. Utterly convinced by him now, Lizzie agrees. McGrade plots to ensure that Jack does not get home and leaks the location of Jack’s safe house. Jack manages to escape again, but the others in the safe house are killed. McGrade’s defensiveness and obsession with Jack begins to give him away. The people around him begin to pick up on his mannerisms and character. McGrade is advised of Jack’s imminent arrival in London. He tries to flee and attempts to convince Lizzie to go with him right away. While Lizzie is packing her bags, Jack arrives and Lizzie can hardly believe it when she comes into the room to find Jack standing there. The last of McGrade’s lies are exposed. There is a stand-off between Jack and McGrade. McGrade is killed by other officers arriving to aid Jack. Similarly with Brody, it is Damian’s acting that helps me perform my opinion of this character and results in a lack of sympathy for him. Right from the start there is something very off putting about McGrade. He rubs the other characters up the wrong way and will pay dearly for it in the end as those who dislike him are more aware of his less redeeming qualities which convinces them to check up on him. The issue with McGrade is that he is very selfish. He is portrayed as someone who has not been affected by his stint as a Prisoner of War. The war is an inconvenience to him which is getting in the way of his life. He wishes to be anywhere else and he doesn’t really care who is who (Allied forces or Nazi), he just wants to be out of the way. This is where Brody wins out for me. Brody wanted to go and serve his country and was captured. Laterally, Brody’s motivations were always around a child he loved. It isn’t even that I would say McGrade is a coward. He just doesn’t care. He is self-serving.